Heide and I have been working on our collaborative novel since last autumn and we’re mere weeks away from finishing a healthy-looking draft of the entire thing. We’ve tackled the collaborative aspect of writing in our own way, simply doing what we felt was right and it’s been interesting to see how other people have tackled the challenge of writing a novel together. A novel of great interest to Heide and me is ‘Draculas: A Novel of Terror’. It’s interesting because it has been collaboratively written by four authors (Black Crouch, Jack Kilborn, Jeff Strand and F. Paul Wilson) and also because the Kindle edition of their book has an appendix which gives us a full account of how their collaborative endeavour came about and how they organised the writing of it. So, each having been written in ignorance of the other, how did the writing of Draculas differ to that of our Clovenhoof novel? And how were the writing methods similar? Each writer took a number of characters, both human and vampire, and followed them through almost the entirety of the story. For the most part, the different writers’ characters do not interact with one another. Heide and I divided the novel not into the plotlines of separate characters but divided it chapter by chapter. We wrote the three central characters equally and made free with minor characters the other one invented. Each writer determined what happened in the section they wrote. Apart from some broad notions and rules set down before the writing started in earnest, each writer was free to take their characters in whatever direction they wished. Heide and I planned individual chapters and then gave them to the other person to write up. Afterwards, each chapter was edited by the original story plotter. 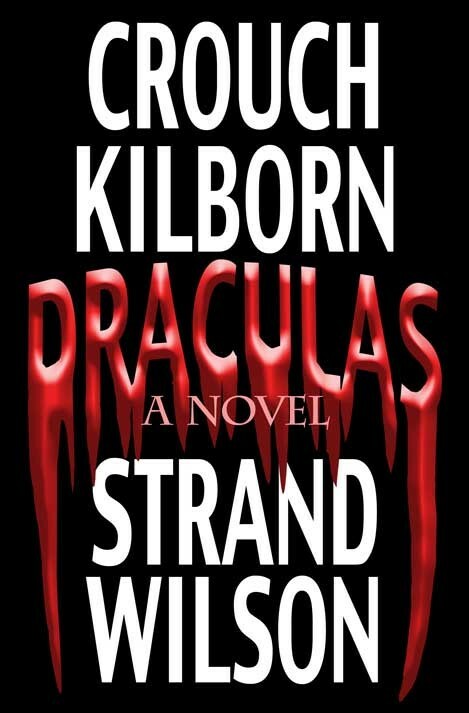 Draculas was written (as much as anything is) in chronological order. The authors started at the points where their characters come into the story and stop at their natural ends (mostly deaths!). Clovenhoof was written in something far from chronological order. This was done so that a) we could write our way into the characters more easily and b) so that we didn’t have to wait for the co-author to finish a chapter before we could proceed. The actual order the chapters were written in was 3, 6, 4, 7, 5, 8, 1, 9, 2, 10, 11, 12. Ultimately, Draculas was edited for tone and consistency by a single person, J A Konrath. All four writers are certainly skilful enough to write in a consistent voice but it was the role of one person to hide whatever seams remained. Heide and I are editing Clovenhoof together. The constant back and forth hopefully means that we are creating a single voice that is 50% Iain and 50% Heide. I honestly think both methods, Draculas and Clovenhoof have things to commend them. The Draculas method is certainly simpler. No way could we have used the Clovenhoof method with four writers. The Draculas method is also quicker. Heide and I have spent as much time discussing stuff as we have writing. However, the Draculas method would probably only work with stories where a relatively large cast of characters are not constantly interacting with one another. NOTE: I remember reading that, in writing Good Omens, Terry Pratchett and Neil Gaiman did split certain groups of characters between them. One of them took the angel and devil character, one took the antichrist and his friends, one took the four horsemen of the apocalypse, etc. 1. Both the Draculas team and the Clovenhoof duo used Dropbox. I am sure people were able to write collaborative novels before the invention of e-mail, the internet and the Dropbox service. I am also sure there are other equally good file-sharing services out there. However, both these novels were written using Dropbox and Heide and I have yet to find a single problem with Dropbox. We don’t get royalties from Dropbox but I recommend it nonetheless. 2. Both novels are driven by characters. Both started with scenarios and some plot ideas but it was the characters who led the way. It was the characters’ responses to the vampire threat that guided the action in Draculas. It was the way Clovenhoof, Ben Kitchen and Nerys Thomas bounced off each other in each chapter that drove our novel. This is obvious in a way. You can’t write a plot-driven novel such as a Christie-esque murder mystery unless there is a single mastermind controlling events and yet, if the writers comprehend the characters they’re working with, they can pass them around amongst themselves. 3. Both novels are fast-paced, incident-packed and fun. Draculas is a beautiful B-movie of a novel which, depending on your tastes, is either gross-out horror or tongue-in-cheek comedy. Clovenhoof is played for laughs and, at times, pretty broad laughs. It is foul-mouthed, frequently crude and very black. Again, this is somewhat obvious. Comedy and entertainment lend themselves to co-operative writing. We can all offer an opinion on what is entertaining or funny. Writing something high-brow collaboratively would be much, much harder. We must offer thanks that the literary greats of ages past had enough sense to write their best work alone. Collaboration is great. But collaboration and great literature? I’ll believe it when I see it. 4. Both novels tightly control character and setting. Draculas takes place almost entirely within the confines of a hospital on single night. 80% of Clovenhoof takes place in a single building. The rest takes place in a church, a school, a handful of shops and a limited number of other locations. Everything happens within a five mile radius. Draculas uses a fixed number of characters (those trapped in the hospital). Clovenhoof has a very limited cast list with three stars, maybe another six characters who are in it from beginning to end and then some mostly-nameless walk-ons. This restriction of the ‘playing pieces’ makes collaborative sharing of ideas a great deal easier and it’s interesting that the writers of both novels saw the sense in that. 5. Speed. The writers of Draculas each had 20,000 words to write and were able to rattle through that at speed. Heide and I leapt into our separate 50,000 words very quickly. There was no eight month period of planning, no long months of soul-searching. We came up with our concept, laid out the characters and jumped straight in. From idea to completion, Clovenhoof has probably taken us nine months. In my book, that’s quick. 6. I’m inferring here but I don’t have to infer much. It is pretty darn clear that the Draculas writers knew each other well and knew that their writing styles would match. Heide and I have known and read each other’s writing for some time. I’ve blogged previously about writing styles matching but there is something more. The Draculas guys were mates. They supported each other, offered honest criticism and their communications were riddled with humour and kindness. Fact is, if you don’t like and support one another then collaboration is going to be difficult, even impossible. Well, damn, now I want to read CLOVENHOOF! Give us a few months to pull the whole thing together (add goodness knows how long for the publishing side of things to sort out the other stuff) and you WILL have Clovenhoof to read. Recently bought 'Wolf Hunt' following a friend’s recommendation. You’ve reminded me to start reading it.